The potential for exploiting heterosis for sorghum hybrid production in Ethiopia with improved local adaptation and farmers preferences has been investigated and populations suitable for initial hybrid development have been identified. Hybrids in sorghum have demonstrated increased productivity and stability of performance in the developed world. In Ethiopia, the uptake of hybrid sorghum has been limited to date, primarily due to poor adaptation and absence of farmer’s preferred traits in existing hybrids. This study aimed to identify complementary parental pools to develop locally adapted hybrids, through an analysis of whole genome variability of 184 locally adapted genotypes and introduced hybrid parents (R and B). Genetic variability was assessed using genetic distance, model-based STRUCTURE analysis and pair-wise comparison of groups. We observed a high degree of genetic similarity between the Ethiopian improved inbred genotypes and a subset of landraces adapted to lowland agro-ecology with the introduced R lines. This coupled with the genetic differentiation from existing B lines, indicated that these locally adapted genotype groups are expected to have similar patterns of heterotic expression as observed between introduced R and B line pools. Additionally, the hybrids derived from these locally adapted genotypes will have the benefit of containing farmers preferred traits. The groups most divergent from introduced B lines were the Ethiopian landraces adapted to highland and intermediate agro-ecologies and a subset of lowland-adapted genotypes, indicating the potential for increased heterotic response of their hybrids. However, these groups were also differentiated from the R lines, and hence are different from the existing complementary heterotic pools. 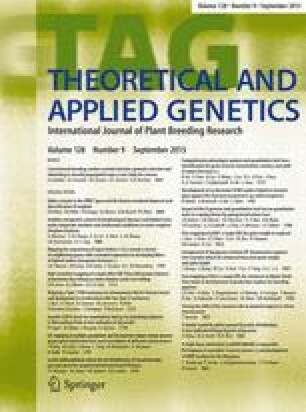 This suggests that although these groups could provide highly divergent parental pools, further research is required to investigate the extent of heterosis and their hybrid performance. The online version of this article (doi: 10.1007/s00122-015-2545-6) contains supplementary material, which is available to authorized users. The authors are thankful to AusAID (Australian Agency for International Development) for the financial support to undertake this research and sponsoring PhD scholarship to TTM and QAAFI (Queensland Alliance for Agriculture and Food Innovation) for research support.